Are you creative? Enjoy sharing smiles? Do you love free pizza? 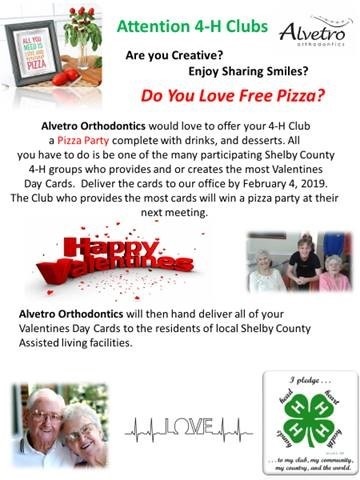 We are excited to announce that we will once again partner with Dr. Alvetro’s orthodontic office for the 2019 Shelby County 4-H Community-Wide Service Project!! As we did last year, we are asking clubs to make handcrafted, personal Valentine's Day cards at their January meetings. All Valentine’s cards submitted will be delivered to residents of local assisted living facilities on Valentine’s Day. I am excited to do this project again! This year, I would like to challenge our clubs to top their number of Valentine’s created last year, which was 1800!! The club who submits the most Valentine’s will win a pizza party. Valentine's Day cards are due to Dr. Alvetro's office OR the Extension Office by February 4. A flyer with more information from Dr. Alvetro’s office is attached. Clubs, If you need markers, scissors, or colored paper, please let us know. We have these items in our office that can be made available for your club’s use. Please let me know if you have any other questions. Happy crafting!